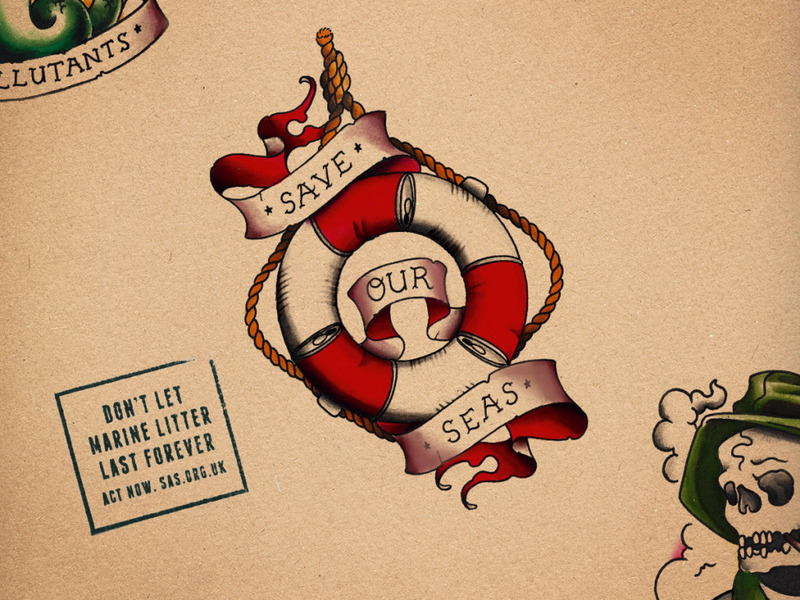 Surfers Against Sewage launches new ‘Save Our Seas’ Marine Litter Tattoo campaign to highlight the growing scale and permanence of the marine litter crisis. The ‘Save Our Seas’ Marine Litter Tattoo campaign takes it’s inspiration from highly stylised maritime tattoos that are synonymous with the sea and those deeply connected to it – mariners, sailors, fishermen, seafarers, explorers and in more recent times, surfers and those seeking thrills, excitement and adventure connected to the coastline. As tattoos, the designs convey a strong sense of permanence, something that the marine litter crisis is threatening if urgent action is not taken soon. The amount of litter recorded on UK beaches in 2014 was at it’s highest level ever with a shocking 2,457 pieces found for every kilometre of coastline surveyed, representing another 6% increase on 2013 levels*. Marine litter is rapidly becoming a permanent, almost indelible feature of global coastlines, detracting from the aesthetic and intrinsic value of beautiful oceans and beaches, threatening ecosystems and killing unique marine wildlife across the globe. The Save Our Seas Marine Litter Tattoo campaign highlights some of the most pervasive litter items washing up on our beaches, including the single-use plastic bag, the plastic water bottle, the aluminium can and discarded fishing gear. These now ubiquitous items have become the new scourge of the high seas. The campaign was created by award-winning advertising agency M&C Saatchi in association with acclaimed American tattoo artist Nick The Tailor to support SAS’s environmental initiatives tackling marine litter. Nick the Tailor’s style has a basis in traditional western tattooing (old school), but over time has developed to include the colours and details that are missing in many traditional designs. Rather than simply using shadows to create depth, he incorporates colour theory and design principles into every piece he creates. The campaign has received strong support from some of the UKs best surfers including eleven times European Longboard Champion Ben Skinner and pro surfer Corinne Evans, who have both been inked in the name of the environment. Ben Skinner, 11 X European Longboard Champion says: “I’m supporting Surfers Against Sewage’s Save Our Seas Marine Litter Tattoo campaign to help protect the UKs unique surf spots, coastlines and beaches. Our surf spots are amazing natural resources and it’s vital that they are protected from all types of pollution including the tide of litter washing up on our beaches. The launch of the campaign coincides with one of the UK’s biggest community beach clean operations: SAS’s Big Spring Beach Clean. Over 5,000 grassroots volunteers will be taking part in beach cleans at 150 of the UK’s most iconic beaches over the weekend of the 28th & 29th of March. Beach clean events are a fantastic way of uniting and inspiring coastal communities to protect the beaches and coastal spaces most important to them, and every piece of litter removed is a victory in the fight against the marine litter crisis. Community beach clean events also leave a lasting positive legacy, with many volunteers forming new networks and beach clean initiatives to protect local beaches on a regular basis. Surfers Against Sewage is working at community, corporate and government level to tackle the marine litter crisis. The recent publication of SAS’s Marine Litter Report sets out a vision to reduce UK beach litter by 50% by 2020. The report highlights the true scale of the marine litter crisis; the underlying causes and the threat marine litter poses to ecosystems, marine organisms and communities. The report also maps out practical and achievable solutions across industry, government and communities to increase action for much cleaner and safer beaches by 2020. Surfers Against Sewage (SAS) is an environmental charity protecting the UKs oceans, waves and beaches for all to enjoy safely and sustainably, via community action, campaigning, volunteering, conservation, education and scientific research.